Aging or weight loss can cause a person’s upper thighs to become saggy and lose the firmness they may once have had. The skin may take on an uneven texture as well. While exercise can help tone leg and thigh muscles, it cannot fix weakness in the underlying tissue or get rid of specific fat deposits. It also cannot tighten skin that has lost its elasticity. In such cases, thigh lift surgery may be the answer. A thigh lift can help patients feel more confident about their appearance and allow them to wear short pants or skirts without self-consciousness by creating legs with a firm, youthful look. A thigh lift is a surgical procedure to shape a patient’s thighs by removing excess skin and tightening the underlying tissue. It may also be performed in conjunction with liposuction to remove or sculpt localized fat as well. A thigh lift will leave a scar in the groin or down the inside of the thigh that may show if the legs are crossed, but will otherwise normally be hidden. At The Plastic Surgery Clinic we perform approximately 50 to 100 thigh lift procedures per year. This makes Dr. Lista, Dr. Ahmad and Dr. Austin well experienced in thigh lift surgery. They are able to achieve natural-looking results with the minimum amount of scarring. If you are considering this important surgery please explore the links on the left to learn more. If you have more questions about whether a Thigh Lift in Toronto/Mississauga is for you, please contact us at info@theplasticsurgeryclinic.com to set up a complimentary consultation with Dr. Lista, Dr. Ahmad or Dr. Austin. Thigh lift procedures are normally performed under general anaesthesia on an outpatient basis. During a thigh lift procedure, the surgeon typically makes an incision from the groin extending down and around the thigh, although an incision from the groin across the hip may also be used to address issues with the outer thigh. In all cases, the inner tissues of the thigh will be pulled together, remodeled, and made tighter with sutures. Then the excess skin will be removed and the incisions sutured closed. The number and placement of incisions will depend upon the amount of skin reduction and remodeling required in order to achieve the desired results. Incisions will be placed in strategic locations whenever possible so as to hide the scars under clothes (including bathing suits). A thigh lift procedure normally takes two to three hours. Your thigh lift can be performed right on site in the state-of-the-art facilities of The Plastic Surgery Clinic. The Clinic meets or exceeds national, provincial, and municipal health care facility standards in such important areas as equipment quality and infection control. If you prefer, you can choose to have your surgery at one of the hospitals where the highly skilled plastic surgeons at The Plastic Surgery Clinic enjoy privileges. These include the Mississauga site of the TrilliumHealth Centre and the University Health Network in Toronto. The best candidates for thigh lift surgery have excess skin or loose tissue in their thighs but are at a fairly stable weight and not obese. Ideal candidates are also non-smokers without underlying health conditions that might make surgery riskier than normal. Smokers should quit for at least two weeks before and after surgery, because smoking inhibits healing. A thigh lift can have a positive effect on your self-esteem. Feeling better about your appearance can make you feel better about yourself. Studies show that this kind of surgery often improves quality of life. Before you decide to have surgery, think carefully about your expectations and discuss them with an experienced Toronto/Mississauga thigh lift surgeon such as Dr. Lista, Dr. Ahmad or Dr. Austin. Dr. Lista, Dr. Ahmad and Dr. Austin are proud to have helped so many thigh lift patients in Toronto and Mississauga learn to feel comfortable in shorts, skirts, and bathing suits that reveal or even show off their thighs. Your consultation will involve a physical examination, including a thorough medical history, and a discussion about your goals with surgery. You will be asked to describe your ideal look; if you can, you should bring in pictures that show body shapes that you admire. Dr. Lista, Dr. Ahmad or Dr. Austin will examine you to determine exactly what procedure or combination of procedures will best help you meet your goals. For a thigh lift, where the incision will be made and whether liposuction is needed will be carefully discussed. Your surgeon will work with you to recommend the procedure that will help you come closest to achieving your desired results. Thigh lift surgery is performed at The Plastic Surgery Clinic as a day surgery procedure. A friend or relative will need to come and pick you up and stay with you at home for at least 24 hours. After the operation, in addition to any bandages placed over the incisions, the thighs will be contained within an elastic (compression) bandage or garment to keep swelling under control. Small tubes may be put in place to temporarily drain fluids that may collect after the procedure. It may take several months for the bruising and swelling to fully recede. Patients should refrain from any strenuous activity for six to eight weeks. The scars will fade by six months. Pain after surgery is not only uncomfortable, it can also slow down the healing process. That is why the surgeons at The Plastic Surgery Clinic take the time to anticipate their patients’ pain needs in advance, in order to help reduce the time it takes for you to get back on your feet. 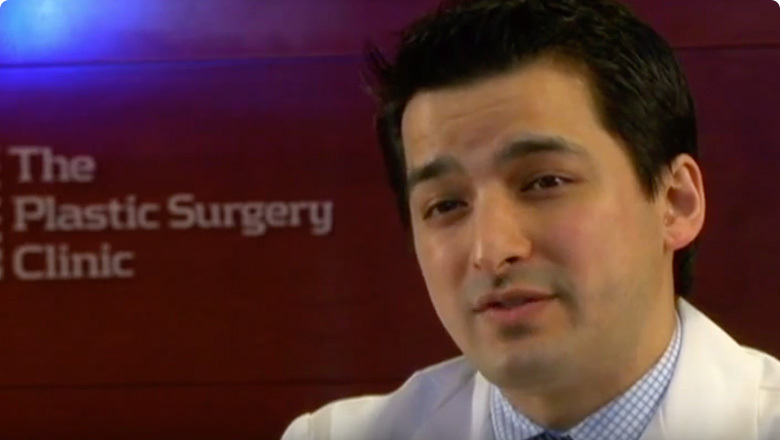 Dr. Lista, Dr. Ahmad and Dr. Austin perform 50-100 thigh lift procedures each year. The results are ordinarily positive and complications are rare. Nevertheless, there are always risks associated with surgery, and there are specific complications associated with this procedure. Your surgeon will discuss these risks with you thoroughly during the consultation process. Most of the thigh lift patients at the Plastic Surgery Clinic are very happy with their results. Thigh lift surgery normally results in thighs that are toned, youthful, and natural-looking. Thigh lift surgery typically has an immediate, long-lasting effect, provided patients maintain a healthy weight. The scars are not normally visible unless the legs are crossed in a seated position, and should fade over time. During your free consultation, your plastic surgeon will provide you with a wide range of photos so that you can see the results of actual thigh lift patients at The Plastic Surgery Clinic. To see a small selection of successful surgery results, please visit our thigh lift photo gallery. You may have concerns that a thigh lift procedure is prohibitavely expensive, but most of our patients find that it is in fact very affordable. At The Plastic Surgery Clinic, we want everyone to be able to make the most of who they are, and so we have financing options available to help you reach your goals sooner. In a complimentary consultation with one of our world renowned plastic surgeons you will discuss your goals and the details of your surgery; then you will be given a detailed estimate of what the surgery will cost. Afterward, one of our excellent patient coordinators will go over payment and financing options with you. Many of our thigh lift patients have remarked that what originally seemed like a daunting cost now feels like an important investment in their happiness. To find out more about the cost of a thigh lift, please contact us by phone or e-mail or by filling out the Request for Information form below.